If you thought the Wachowskis’ Matrix films were mind-blowing and something unlike anything else before it… you still will after watching their latest film Jupiter Ascending. But that’s not to say it doesn’t have anything to offer; it’s both exactly what you’d expect it to be and also something completely unexpected at the same time. So, what is it exactly? It’s an experience, to say the least. However, it’s not the sort of enthralling experience you’d find in something like Gravity – rather, it’s a bit more cluttered, not well thought out, and certifiably insane experience, the kind where we have to make sure we didn’t accidentally inhale marijuana smoke while watching (hey, it could happen). Honestly, we’re at a loss for words on how we really feel about it. On the one hand, it is a dumb sci-fi action flick with almost all of its story borrowed from other sources, plot holes and gaps in logic that don’t add up, and an overly-complicated storyline that leaves you unable to care for large strands of the story. On the other hand, it’s nothing if not ambitious; the Wachowskis have a tendency to display all of their ideas on screen, even the ones that aren’t thought through all that much, but here they seem to be revelling so much in all of its strangeness and over-the-top campy nature that it’s hard not to get sucked in to the fun yourself. Both hands carry an equal amount of weight, but in the end which one can end up being our own opinion? Well, firstly let’s take a brief look at what doesn’t work. Even though it claims to be a wholly original idea (i.e. not adapted from a previous source material), you can still recognise many of its plot threads and other elements from other movies. At its core is the archetypal “Chosen One” storyline that they used before for Neo in The Matrix, this time with half-Russian immigrant Jupiter (Mila Kunis, mostly stuck in a bland audience surrogate role) being selected as the apparent heir to Earth because of some genetic recoding or something science-fiction-ey. That’s not all, as there are similarities left and right to things like John Carter (an Earth-bred human is transported to the cosmos, and there’s a wedding involved), the Star Wars prequels (its constant green-screen backgrounds, while gorgeous to look at, can be tiresome after a while when we know they don’t really exist) and, in a very bizarre and out-of-nowhere tone shift, an entire sequence that seems to riff on Brazil, complete with its very own Terry Gilliam cameo. Not even its actors can distract from the incessant unoriginality, with the majority inhabiting bland characters with stiffened but spirited direction. For instance Channing Tatum, as a strange genetic mutation of a wolf and human with silly Spock ears, is only there to save the increasingly-stupid Jupiter from falling heights and has his potential and regular charm mostly reduced to almost nothing. Most watchable out of everyone, however, is Eddie Redmayne as snarling baddie Balem – but maybe that’s just because of how… we don’t want to say “bad”, but he’s certainly not good here either. Alternately rasping his words with a gentle whisper before shouting at random, and providing a facial transformation that even leaves his far superior work in The Theory of Everything in the lurch, it’s something that can’t really be described in words. You truly need to see this performance for yourselves; forget the rest of the movie, THIS is the real epic struggle of the film, between an otherwise great actor and some heavily unbalanced direction. If his intention was to channel the likes of John Travolta and Jeremy Irons in Battlefield Earth and Dungeons and Dragons respectively, then mission accomplished for Redmayne – shame the Wachowskis in this instance didn’t feel the same. What they did feel, however, was the need to throw everything in their collective thought process onto the screen, and all these ideas and strands of inspired lunacy come together in something that is surprisingly entertaining. We’ve mentioned that there are genetically altered humans as with Tatum, but we forgot to mention that it extends to genetic alteration with bees (represented by Sean Bean – who let’s just say has made me lose a fair bit of money in a bet) and even elephants – and since you’re asking, yes the sight of a human-elephant splice piloting a spaceship IS indeed as batty as it sounds. There’s also gravity boots, some sort of youth-enhancing skin formula that harkens back to a certain type of Soylent Green, and even winged lizard creatures that look like a mix between the raptors from Jurassic Park and the Goombas as depicted in the Super Mario Bros movie – and that’s not even touching the many questions that the Wachowskis try to pose as well. It’s all a bit too much, not to a point where it’s overwhelming but it certainly leaves you exhausted when trying to process everything that the film presents. However, the visuals are beautifully done even if the films relies a bit too heavily on them, and the ideas that do work and arouse interest are at least entertaining in how poorly they’re handled to ensure a degree of entertainment. 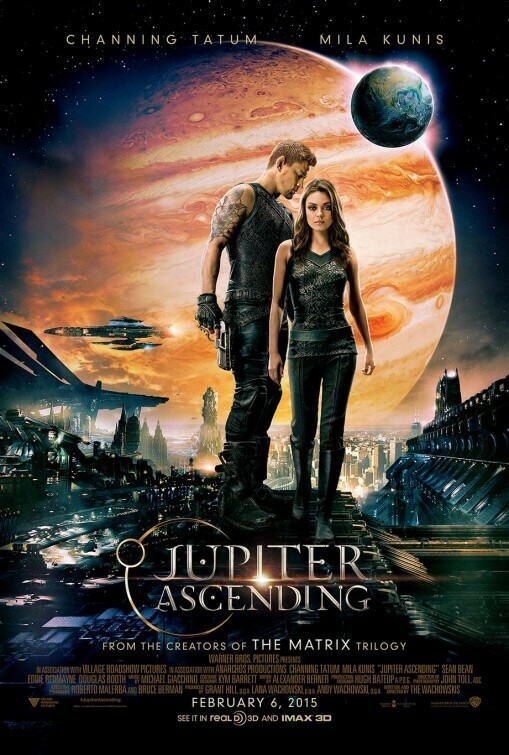 Overall, we like to think Jupiter Ascending is something of a failed experiment. There are some interesting things about it, but more often than not the negative aspects outweigh the positive ones. It’s a shame, considering the talent involved, but when your only Oscar-nominee of the cast is reduced to a drooling and over-the-top dreck, it’s a problem all on its own.